My Orange Brompton: Brompton back from being serviced. 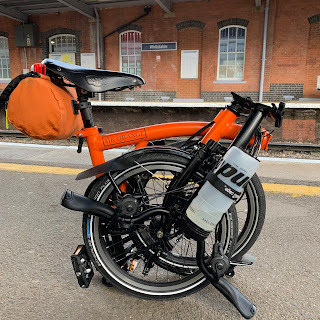 My Brompton was actually ready for collection late yesterday afternoon but I was unable to collect it from the Specialized Concept Shop in London. I collected it first thing this morning and they did a really good job. I have an ML6 and I had noticed that the gear change was a little sluggish. When I gave it a test run all was perfect with an almost instantaneous change. In addition the seat pillar was sticky but it now glides up and down with ease. Many people think that Specialized shops cater for racing road bikes or serious off road mountain bikes. They are also Brompton sellers and you can get your bike serviced there. The good thing is that being an authorised Brompton seller/service centre, they carry a good range of Brompton spare parts meaning most repairs can be carried out swiftly. Tomorrow will be my first time out on my Brompton since the BWC launch event. I will be testing my new cargo cycling shorts and only hope that I have recovered enough to enjoy my newly serviced folding wonder.